IMPACT PERFORMANCE SERIES(TM) NUTSETTERS Lobular nutsetters built for maximum - durability, performance & long life Designed to drive fastener from the side - rather than forcing the corner to turn Design provides more clearance on the corners Powerful magnet holds fastener securely in place 1/4" quick change shank One bit per card 1837562 1/4 X 6 MAG NUTSETTER HEX DRIVE:1/4" x 6" SOCKET DIA. :7/16"
IMPACT PERFORMANCE SERIES(TM) NUTSETTERS Lobular nutsetters built for maximum - durability, performance & long life Designed to drive fastener from the side - rather than forcing the corner to turn Design provides more clearance on the corners Powerful magnet holds fastener securely in place 1/4" quick change shank One bit per card 1837564 5/16 X 6 MAG NUTSETTER HEX DRIVE:5/16" x 6" SOCKET DIA. 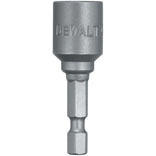 :1/2"
IMPACT PERFORMANCE SERIES(TM) NUTSETTERS Lobular nutsetters built for maximum - durability, performance & long life Designed to drive fastener from the side - rather than forcing the corner to turn Design provides more clearance on the corners Powerful magnet holds fastener securely in place 1/4" quick change shank One bit per card 1899935 1/2 X 1-7/8 NUTSETTER HEX DRIVE:1/2"x 1-7/8" SOCKET DIA. 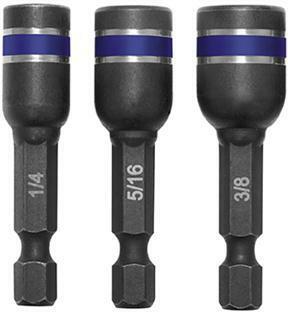 :3/4"
IMPACT PERFORMANCE SERIES(TM) NUTSETTERS Lobular nutsetters built for maximum - durability, performance & long life Designed to drive fastener from the side - rather than forcing the corner to turn Design provides more clearance on the corners Powerful magnet holds fastener securely in place 1/4" quick change shank One bit per card 1899938 1/2 X 6 MAG NUTSETTER HEX DRIVE:1/2" x 6" SOCKET DIA. 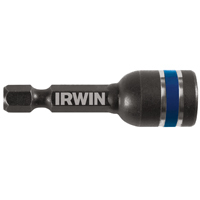 :3/4"
6-in-1 NUT DRIVER Combines 6 sizes of nut driver into one tool Features on-board storage of 3 double-ended - sockets for easy access to 6 different hex sizes Compact, in-handle socket storage for easy - access to all double-ended sockets 3-Zone comfort grip increases comfort in - high and low torque applications Available in SAE and Metric sizes 1948778 6-N-1 SAE NUTDRIVER DESC:SAE Sizes COLOR:Blue/YellowSAE Sizes Include:1/4", 5/16", 11/32", 3/8", 7/16" & 1/2"
MAGNETIC LOBULAR DESIGN NUTSETTER 4x more powerful than common magnets Made of shock-resistant & heat treated tool steel Fits most power tools & quick-change adapters Positive retention of screw improves install rate 1/4" shank diameter Carded, 1-pc. 3547121C 1/4 IN. 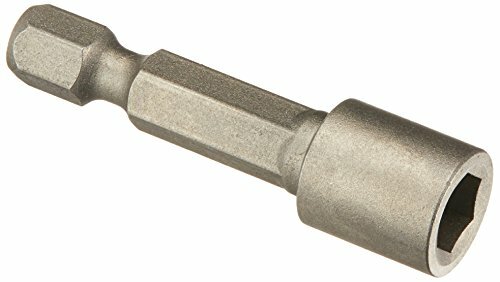 MAG NUTSETTER SIZE:1/4" LENGTH:1-7/8"
MAGNETIC LOBULAR DESIGN NUTSETTER 4x more powerful than common magnets Made of shock-resistant & heat treated tool steel Fits most power tools & quick-change adapters Positive retention of screw improves install rate 1/4" shank diameter Carded, 1-pc. 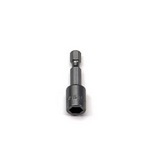 3547321C 5/16 MAG NUTSETTER SIZE:5/16" LENGTH:1-7/8"
MAGNETIC LOBULAR DESIGN NUTSETTER 4x more powerful than common magnets Made of shock-resistant & heat treated tool steel Fits most power tools & quick-change adapters Positive retention of screw improves install rate 1/4" shank diameter Carded, 1-pc. 3547521C 3/8 IN. 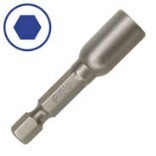 MAG NUTSETTER SIZE:3/8" LENGTH:1-7/8"
MAGNETIC LOBULAR DESIGN NUTSETTER 4x more powerful than common magnets Made of shock-resistant & heat treated tool steel Fits most power tools & quick-change adapters Positive retention of screw improves install rate 1/4" shank diameter Carded, 1-pc. 3548321C 5/16 IN. 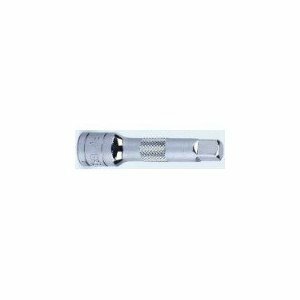 MAG NUTSETTER SIZE:5/16" LENGTH:2-9/16"
MAGNETIC LOBULAR DESIGN NUTSETTER 4x more powerful than common magnets Made of shock-resistant & heat treated tool steel Fits most power tools & quick-change adapters Positive retention of screw improves install rate 1/4" shank diameter Carded, 1-pc. 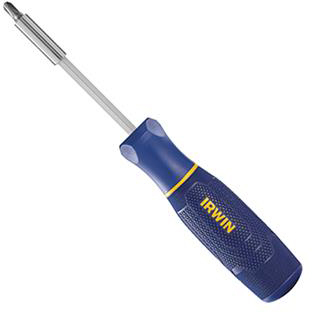 3548521C 3/8 IN. 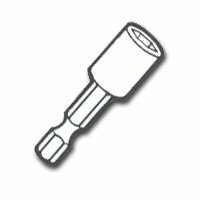 MAG NUTSETTER SIZE:3/8" LENGTH:2-9/16"
MAGNETIC LOBULAR DESIGN NUTSETTER 4x more powerful than common magnets Made of shock-resistant & heat treated tool steel Fits most power tools & quick-change adapters Positive retention of screw improves install rate 1/4" shank diameter Carded, 1-pc. 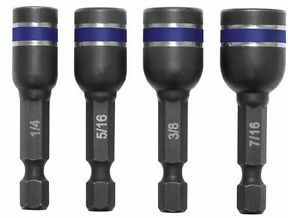 3548721C 7/16 MAG NUTSETTER SIZE:7/16" LENGTH:2-9/16"
SHOCKWAVE(TM) MAGNETIC NUTDRIVER Shockwave Impact Duty(TM) magnetic nut drivers - are engineered for extreme durability Heat-treated proprietary steel controls hardness Feature powerful magnet for secure grip Color-coded rings for easy size identification Chamfered edge allows fastening in tight spaces 1 per card unless noted 49-66-4505 3/8 IN. 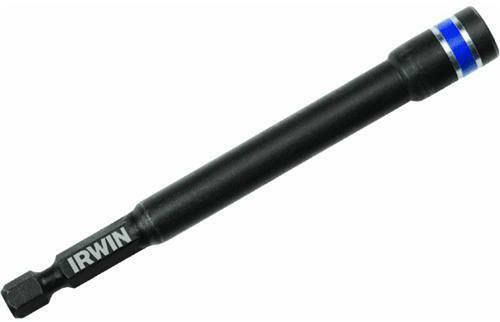 MAG NUTDRIVER SIZE:3/8" LENGTH:1-7/8"
SHOCKWAVE(TM) MAGNETIC NUTDRIVER Shockwave Impact Duty(TM) magnetic nut drivers - are engineered for extreme durability Heat-treated proprietary steel controls hardness Feature powerful magnet for secure grip Color-coded rings for easy size identification Chamfered edge allows fastening in tight spaces 1 per card unless noted 49-66-4525 3/8 3PK MAG NUTDRVR SIZE:3/8" (3/Card) LENGTH:1-7/8"
MAGNETIC NUTSETTER Use for power driving hex head screws Also bolts & nuts Single-piece construction For electric drills & power screwdrivers 1/4" shank 15889 5-16 IN. 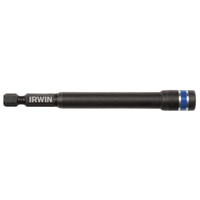 MAGNETIC NUTSETTER SIZE:5/16"
IMPACT READY MAGNETIC NUTDRIVERS For use in cordless impact drivers Rated up to 2000 in-lbs of torque Packed one per card DW2219IR 5/16X1-7/8 NUT DRIVER SIZE:5/16" x 1-7/8"
5/16" MAGNETIC TIP NUT DRIVER Exclusive hollow shaft design with Rare Earth- magnetic tip for unobstructed pass-through Internal flanges provide solid, twist - resistant shaft anchor Cushion-Grip handle for greater torque & comfort Handle end is color coded for identification Shaft is chrome-plated for corrosion resistance 630-5/16M 5/16 IN. 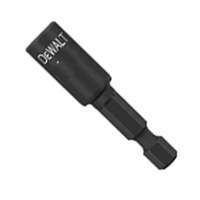 MAG NUT DRIVER SIZE:5/16" x 3" OVERALL:6-3/4"